Throughout the first three months of the season, the Colts defense has had to deal with injuries in each respective position group. Perhaps no position has been hit as hard as the outside of the defensive line. Nose tackle Antonio ‘Mookie’ Johnson has been a mainstay in the middle of the 3-4 hybrid defense but the players flanking the nose position will be ever-changing the rest of the season. Fili Moala and Drake Nevis were placed on injured reserve at different times this month, sending Ricardo Matthews into the starting lineup. 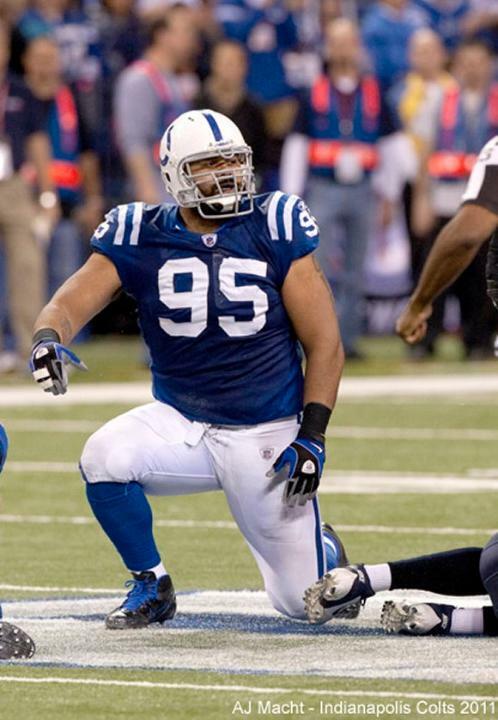 The loss of Moala and Nevis means more playing time for Clifton Geathers, who was signed by the Colts at the start of October when Moala was inactive for four weeks. Geathers and defensive end Lawrence Guy (signed on Oct. 17) will take on a greater role in the coming weeks as the Colts continue to plug in interchangeable parts along the defensive line. Earlier this week, the Colts signed defensive tackle Kellen Heard and interim head coach Bruce Arians is anxious to see the 6-foot-6-inches, 339-pound Heard in action. After injuries with outside linebackers Robert Mathis and Freeney early in the season, the Colts defense was just starting to get completely healthy in the front seven before the losses of Moala and Nevis. “When I look out there right now, the core guys are there,” interim head coach Bruce Arians said. Fili Moala has seen, and excelled, in this defense before. During his days at the University of Southern California, Moala was part of a dominant Trojans defense that wrecked havoc throughout the Pac-10. Having the chance to play in a system that he has thrived in the past, has the four-year veteran anxious to get another season started. The Colts defenders have preached the importance of stopping the run throughout the first week of training camp. Moala falls right in line with his teammates, but he even took it a step further when asked how good this defense could be in 2012. “I love this new defense. The defense is great, great concepts, great enthusiasm from the coaching staff,” Moala said. For the Colts returning players on defense, Moala feels the new hybrid 3-4 system has ‘rejuvenated’ a lot of defenders. Considering himself one of those ‘rejuvenated’ players, Moala provides the defensive line with some versatility and is ready to get back to the All-American player he was at USC. “Personally, I feel like I’m improving each and everyday as well as everyone else on the team. I have nothing but good feelings about this defense and where the team is going,” Moala said.